Sir Francis Bacon famously remarked that the three greatest inventions in his time were gunpowder, the compass, and the printing press. Even then, his list should have also included cotton, paper, steel, and the wheel. These innovations were important beyond the magic that each could perform but also because, unlike simple tools or fire, only human ingenuity could create them and find uses for them at least as ingenious as the inventions themselves. Alexander Monro sets out to do such justice to true paper “plant or vegetable fibers and it must be macerated.” Paper was independently developed in China, Polynesia, and the Americas, respectively, but here the author chiefly examines it in the context of the importance of the Chinese culture to our modern world by way of Europe. Beyond the special human intelligence and memory, people have sought ways of communicating and record keeping. Means towards the latter end have included raw tree bark, bamboo, clay tablets, turtle shell, papyrus, vellum, broken pieces of pottery, and even writing on walls. Monro writes that Marco Polo discovered the Chinese printing money on paper in 1275 ACE. The previously illiterate Mongols had by then come to rule by paper. Ironically, the illiterate Polo’s bestselling account of his time in China would be published in Europe on paper. Each “fresh new edition was copied out by hand” for the Europeans had not yet picked up on printing (or paper money). The account of Polo’s trip to what is today Beijing survived in all of its wonder to today in books that can be carried in paper bags and boxes through purchases made with paper money and recorded on paper receipts. The reader could then go to the bookstore’s coffee shop for a paper cup of Joe (likely strained through a paper filter). A snack on a paper plate and a disposable napkin is consumed, as he or she reads the adventures of Marco Polo. Such analogies in The Paper Trail are dizzying. Paper was also used for containers, food, toilet paper, kites, insulation, Japanese balloon bombs (in 1944), and so much more. The Chinese developed writing that led to paper which in turn created books that inspired ideas and improved communication, including through increased literacy, libraries, and universities. The Paper Trail includes an account of the development of the writing as well. The inexpensiveness of paper encouraged the development of other mediums that weighed less per knowledge recorded on paper, like microfilm. Paper brought on such machines as the copy machine and the personal printer. This narrative is made from dramatic stories of inventors, philosophers, explorers, empresses, translators, printers, and on and on in China and in Europe. It even includes instances of valuable day-to-day information found on the back of recycled paper. 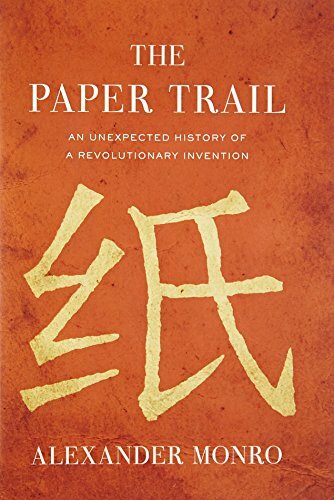 The Paper Trail is a great adventure in a secret history found all around us. It teaches not just about this hugely valuable commodity through history but how humans uniquely develop ideas for inventions that themselves come to serve thinking in so many ways. For Monro’s discussion of the value of paper and ink in education, information, and learning The Paper Trail is a good read.